Leaving home for the first time was very exciting for me. I remember that period of my life very well. It was very much like transitioning from Jr. High to High School or something. I felt like I had finally got my driver’s license and could drive anywhere I wanted without the parentals to just, well, leave. It was exciting to just leave. So, when I moved away from my home state for the first time, I was excited because I was launching off on my own with no one but myself tying me down. I was born and raised in Arizona – the place where my sisters, parents, grandparents and I call home. Mine and Brandon’s families have deep lineage there, and our home state is very close to our hearts but, man, it felt good to leave. It was 2007 and we were headed to Fort Carson, Colorado (near the city of Colorado Springs). I had never been to the Centennial State and yet somehow I “knew” what I was in for. Visions of snow covered pine trees as far as the eye could see, vast purple mountains, and light, crisp air teased me in those final dry, hot days of an Arizona fall. I donned a perma-smile, and every time someone asked me when I was leaving I was quick to answer, having the days left numbered on my calendar. I walked around with this ridiculous grin as if I was finally the chosen one – like I was selected out of thousands to be Captain of a ship setting sailing on a great oceanic adventure. I had never left home before, I didn’t know what to expect in my new home, and yet I couldn’t wait to leave. We arrived at our apartment in Colorado after nine in the evening. The dreadful twelve-hour drive made me want to jump out and run as soon as the car parked, but even still, I couldn’t wait to check out our new home. At the time I blamed it on the fact that it was dark and I was weary from the long drive, but what I felt when I saw our new home was – disappointment. Sure, there were pine trees, but they didn’t extend as far as the eye could see. I put myself to bed that night and despite sleeping on a futon because the movers hadn’t yet arrived with our belongings, I slept deeply. The next morning I awoke to finally check out the place in broad daylight. I was still in total disappointment. It was nice, but so not what I expected. The weeks following our first big move just confirmed my disappointment. The city was small with few amenities. There was little-to-no night life. That was before smart phones were made affordable, so I didn’t have cool iPhone apps to aid in my despair nor a GPS for the car. For an admittedly directionally challenged woman, this was a hell of an adjustment for me. I know this a small-world problem. I’m in no way trying to make being lost in a new city sound more than it really was. It’s just that I was in a place I didn’t know and I felt very vulnerable. I ventured away from my home state with everything familiar to me to - leave - to start my life where everything was unfamiliar to me. I didn’t know what to expect, but I did it. Now, here we are six years later and four big out-of-state moves later. We left our home in Colorado years ago, and in hind-sight, I really do appreciate that city and everything it offered us. It’s a beautiful state with such friendly people. When I first arrived I met two or three Colorado Springs natives (they weren’t just native Coloradans, they were native to the city of Colorado Springs). I know I looked at them like they were crazy. How could they not have left that small city with all it’s crazy snow covered roads, poor excuse for shopping, and zero night-life? I actually thought they were crazy. I’m not joking. I couldn’t comprehend how they were still living in the place where they were born. I suppose their birth place was just as much a part of their hearts as Arizona is to mine. We’re anticipating another PCS (permanent change of duty station, i.e. a move out of state) next month. I t’s now when I’m drawn to remember the first time I left home and how utterly excited I was for my adventure. Now while I initially wince at the thought of uprooting the girls, house hunting, packing and learning the lay of new land, I still get tremendously excited just like the girl who left home for the first time– embarking on a fresh start complete with new home, new friends, new memories. We’re leaving. Because I love snooping on other people's photos more than taking photos (BIG. I love snapping photos), here are some for your snooping pleasure - scenes from Colorado, our great first life adventure in the army. Dreaming of pine trees in place of palm trees. 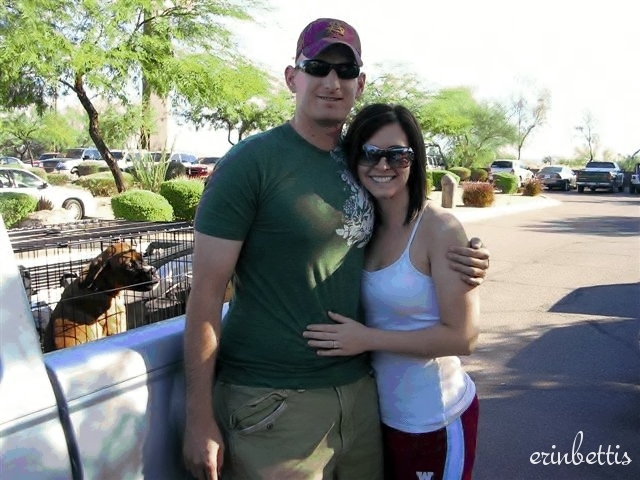 The last photo taken of us in Arizona before the 12-hour drive/move to Colorado. Oh, and Mitzi, our boxer pup in the back. Kissing Camels at the Garden of the Gods. The Zoo overlooking the city of Colorado Springs. I'm going to try to grab that book this weekend so I can follow along with you (even though I'll be a week behind). I'm super excited to have you closer! Love!